I am a yoga teacher-in-training currently enrolled in a 500 hour certification program. The first 100 hours of my teacher training took place in Dharmasala, India. Since then, I have completed 360+ hours through various workshops and training programs (primary ashtanga focused). I have made it my work to learn more about myself and this wonderful practice called yoga so that I can really offer it up when I finally do become certified. Since the beginning of my yoga journey, I have gravitated toward a very dynamic practice (power, vinyasa, ashtanga, etc). 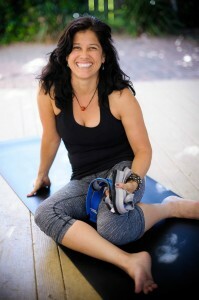 In 2013, faced with increased struggles with chronic back pain coupled with intermittent issues surrounding my mild scoliosis, bouts of sciatica, and a propensity for SI joint instability, I learned the importance of finding the gentler form within the practice (and not necessarily a different type of yoga). As I become a more “seasoned” yoga practitioner (as my teacher would say), I am discovering that balancing strength and flexibility is also very important to minimize the discomfort that can come from both aging. Nutrition, self-care, sleep/rest and recovery has also become a part of my self-study practice. In addition to yoga, my other play includes obstacle course racing, hiking/backpacking, running, and all things outdoors. I am a mother of 3 boys, with a background in nursing. By the time I am teaching yoga, I will have completed the majority (if not all) of my 500 hour certification requirements. I believe I will much to offer my students due to my own lessons-learned on and off the mat.